When I was very young, I only remember there being two kinds of cookies in the house, if you don't count graham crackers. I'm not sure where graham crackers fit into the spectrum of cracker/cookie/dessert. They were sweet, it's true, but they were always served to me in a bowl with milk, for breakfast. Your mileage may vary, of course. So not counting graham crackers, the first cookie I remember eating was the ubiquitous vanilla wafer. I have a memory of sitting at the kitchen table with my great aunt Lil, a small pile of vanilla wafers in front of me. "Hey," my aunt said, "Do you want half moon cookies?" "If you say you want them, then I'll show you," she said. Intrigued, I said ok. After which she promptly grabbed all of my cookies and took a bite out of each one, leaving a pile of "half moon" uneaten halves for me to consume. Ewwwww, gross. And she wouldn't let me get more. And since I didn't want to eat her sloppy seconds, she ate them. I'm sure that was supposed to be some kind of lesson for me, but all I learned was never say yes to anything offered to me by my aunt (this was not the only "lesson" she taught me). The next cookie I remember tasting was a ginger snap. They were one of the few cookies my mother liked, so they were often in the house. It was bigger and looked much more interesting than the vanilla wafers, and it had a sharp sweet smell, so I was intrigued enough to take a bite. And it was good, but it also had a sharp hot afterbite, for which I did not care at all. It was actually even more disappointing than being cheated out of my vanilla wafers, because they actually tasted good before that hot spicy kickback. Fast forward to the year before last, when I made graham crackers. They were so successful and so good (you really should give them a try - they are SO much better than store bought, and much healthier too) that I started to wonder what other childhood delights I could try to make from scratch. I don't know why ginger snaps was the first thing that came to mind, but there you have it. And in the intervening years between now and that first ginger snap I tasted, I have come to enjoy ginger in all of its forms, including that sharp hot after-kick that I now love. But the last time I had the store-bought version, it tasted off to me. Almost all ready-made products taste off to me now. It's like all I can taste are the things that are added to make them shelf stable. So I decided that I would tackle ginger snaps at some point. This past Christmas I was at my brother's house and the subject came up. 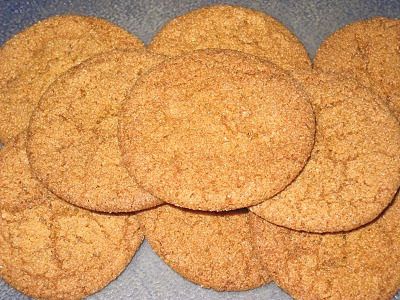 I don't know exactly how or why, but I mentioned that I planned to make ginger snaps in the near future. And then, when my brother and I went out to visit my other brother and his family, we came home to a lovely spicy aroma, and darned if my sister-in-law hadn't gone online, found a recipe, and made them herself! She actually found two recipes, one that called for shortening (which we are all trying to avoid), and the other calling for oil. The first recipe she used was the one with the shortening, and I have to say that they were quite delicious. They had that same sweet spicy taste that ended with the gingery bite at the end. But they have shortening in them, and she wanted to try the recipe that calls for oil to see if the cookies would be as good as the first batch. And everyone agreed that they had the better texture, but they did not taste as gingery. For a good reason - they had less ginger and more other spices in them so the flavor was diluted. But they were all good, and disappeared quite quickly with five-plus people around to help. When I got home, I decided to do my own experiment. I knew I did not want to use shortening, so I decided to do a test between the oil version and substituting butter for shortening in that version. In both versions, however, I decided to stick to the version that used more ginger. For the first version, I used butter. I wasn't sure whether or not it would work, because butter makes the cookie spread out more, and it makes it crispier. 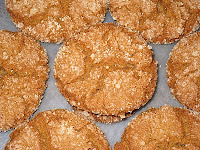 Ginger snaps have a slightly chewy texture that I didn't want to lose. And I had read in several places that you should not use butter with ginger snaps, for the reason listed above, but I am determined not to use shortening. I took the cookies to work with me and they disappeared quickly. Everyone liked them - a lot. But I was still interested to see the difference between the butter version and the oil version. This is the oil version. (The butter version is pictured up at the top.) To me, they look more the way ginger snaps should look. The sugar stands out more because I used the sugar with which I had coated the Glazed Lemon Poppyseed Hearts so it was already a little clumped together, but what I really liked was the way the tops had cracked, which is what makes a ginger snap a ginger snap, in my opinion. 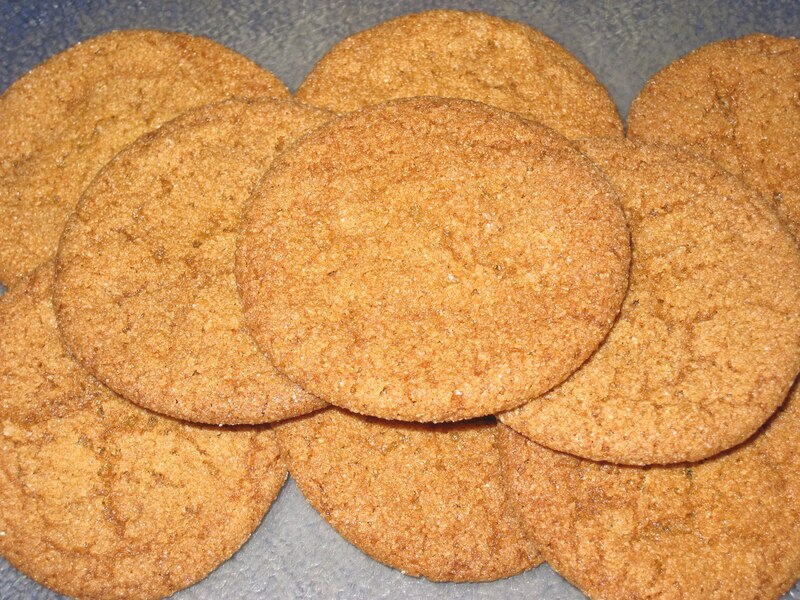 I also liked the taste and the texture of these a little more - they were a little more chewy and less crisp than the butter version, which more closely resembled what I think of when I think of ginger snaps. But when I took these to work, while everyone said they were good, the overwhelming response was that the butter version was hands down the better cookie - light, thin, and crispy, as well as full of ginger flavor. In all honesty, I think both versions work, and are quite tasty and full of that wonderful gingery goodness. But if you're not sure which one you would like, make both give and them to your friends for a taste test. It's a win-win no matter which one they like better. In a large bowl, cream the butter and sugar, then add the egg. Beat until the mixture is light and fluffy. Add the molasses. Combine the flour, baking soda, salt, cinnamon and ginger. Add it to the butter, sugar and egg mixture and stir until everything is well combined. Roll the dough into one-inch balls. Dip the tops into the remaining half-cup of sugar and then place on the baking sheet 2 inches apart. Bake for 10-12 minutes, turning the pans around halfway through baking. Place the cookies on a wire rack and let them cool completely.